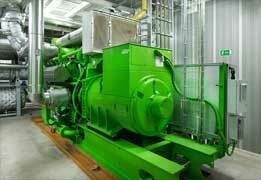 More and more (often large) companies save on their energy costs by using a Combined Heat and Power installation. For a variety of reasons (unknown, too complex, too large investment,…) the technique is not used frequently in smaller and midsized companies. However EVS offers a service where it takes care of het investment, a proper installation and the management of the installation. This saves you from a lot of headaches, but offers you the advantages of a environmentally friendly technique which supplies you cheaper electricity compared to the electricity that is bought via the grid. Want to know more about Combined Heat and Power?